According to solar experts, the "general consensus is that we’ve passed the peak" of the current ~11-year solar cycle. If solar geomagnetic activity has also peaked for the current solar cycle, the Ap index of geomagnetic activity declined about 66% so far at solar maxima over the past three solar cycles. 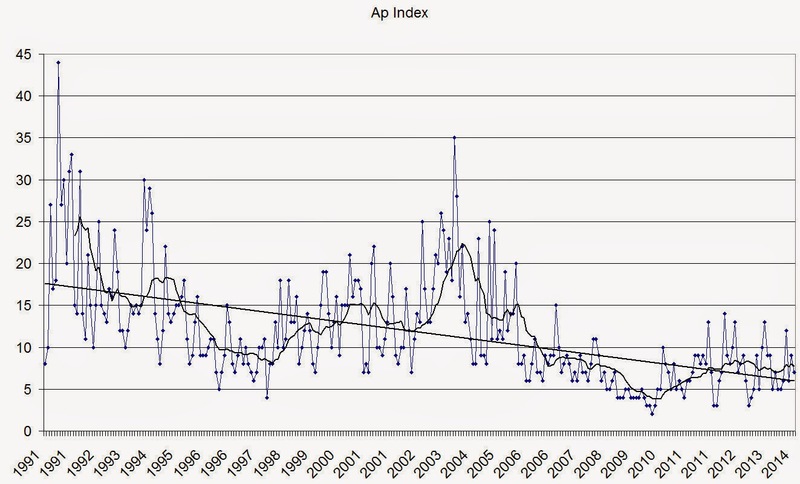 The Ap index is one of many indicators of solar activity including total solar irradiance, sunspots, radio flux, and several others, and has particular relevance to the Svensmark cosmic ray theory of climate. Solar geomagnetic activity shields galactic cosmic rays from Earth, which according to Svensmark's theory, nucleate cloud formation. 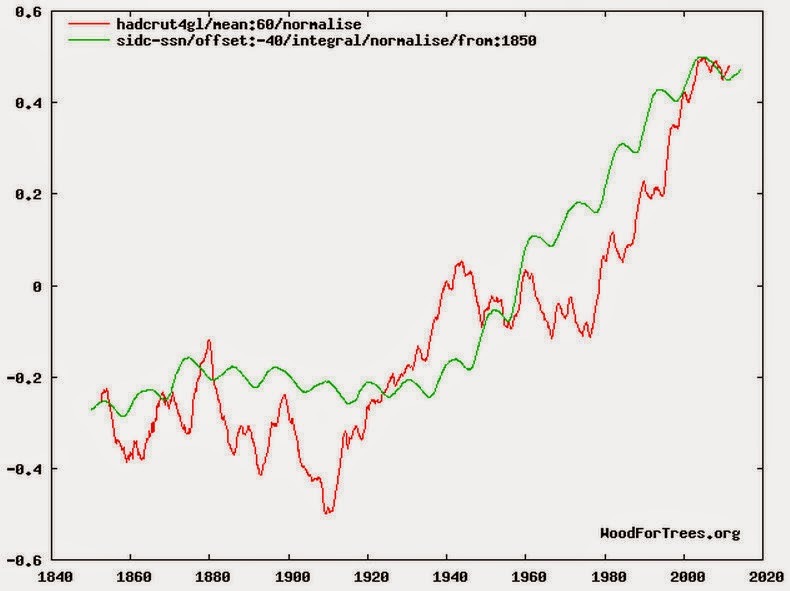 It will be interesting over the next several years to see if this decline in solar geomagnetic activity is found to increase cloud formation and potentially surface cooling. Assuming solar geomagnetic activity has peaked for the current ~11-year solar cycle, the Ap index of solar geomagnetic activity [NOAA/SWPC data from Jan 1991] shows a linear decline from solar maxima over the past 3 solar cycles of ~66%, as well as from the peak of the 1-year moving average shown. 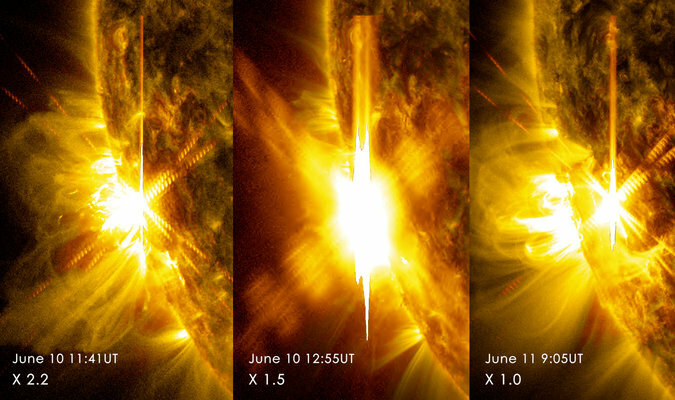 Indeed, the maximum — the peak of the 11-year sunspot cycle, when the sun erupts with solar flares and energetic bursts of electrons and protons — may have already passed. In 2006, at the end of the previous solar cycle, Mausumi Dikpati, a scientist at theNational Center for Atmospheric Research in Boulder, Colo., undertook an ambitious endeavor — a computer model using the basic physics of the sun to forecast what would happen next. Her model made two main predictions: The cycle would start slowly, and it would be a big one, one-third to one-half stronger than the last one. In part, that was because the model did not capture the sun’s split personality this time around. The sunspots peaked first in the sun’s northern hemisphere, in 2011, and then faded away, leading to an intermission when the sun was almost blank at what was supposed to be maximum. Solar physicists expected that the southern hemisphere would belatedly perk up, and last fall it did, producing a second peak that was larger than the first. Dr. Dikpati and Dr. Pesnell were members of a panel that was to come up with a consensus prediction in 2007 but could not. The panel instead split, some agreeing with Dr. Dikpati on a strong maximum. Others, including Dr. Pesnell, expected a weak maximum, based on other indicators like the strength of the magnetic fields near the poles at solar minimum. They will have more data to think about. Convection within the sun moves gases from the equator toward the poles, and many solar scientists think the speed of that flow helps determine the strength of the sunspot cycle. Some argue that a faster flow induces stronger magnetic fields and more sunspots. Others argue the reverse, that a faster flow inhibits sunspots. Not only do the scientists disagree on the theory, but at present they do not even agree how fast the flow is moving, with different techniques measuring different speeds, Dr. Pesnell said.